Master Yoda is on of the most renowned and powerful Jedi Masters in galactic history. Are you ready to unleash the full force of Lightsaber Battle Yoda? 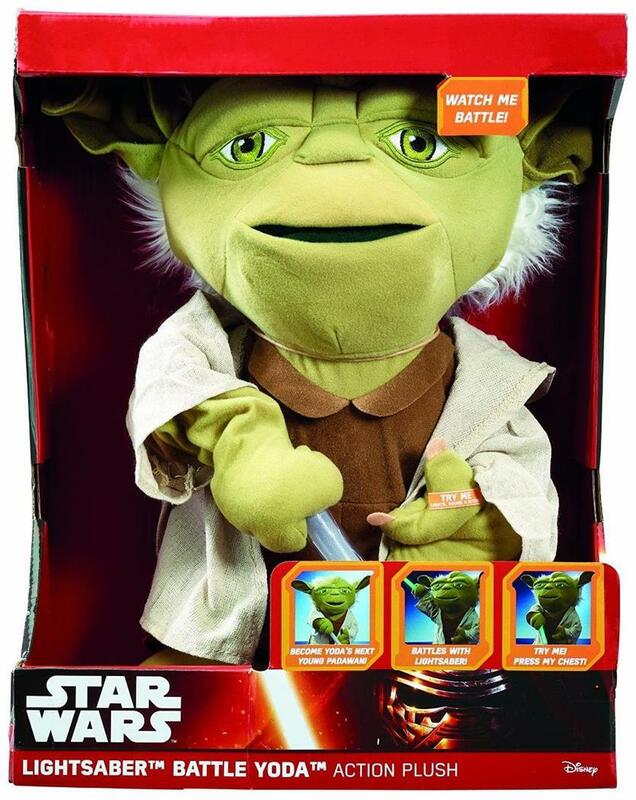 As the latest addition to Underground Toy's officially licensed Star Wars Action Plush range, Lightsaber Battle Yoda combines awesome animatronics with the original and iconic Yoda quotes from the classic movies. Simply press his buttons and watch in amazement as Lightsaber Battle Yoda's face and ears move and he swings into action with his lightsaber. Spoken phrases include "Powerful you have become," "Faith in your new apprentice misplaced may be," "As is you faith in the dark side of the force," "Fought well you have my old padawan," and "Much to learn you still have". It also plays the Star Wars theme music! Master Yoda is on of the most renowned and powerful Jedi Masters in galactic history. Are you ready to unleash the full force of Lightsaber Battle Yoda? Lightsaber Battle Yoda combines awesome animatronics with the original and iconic Yoda quotes from the classic movies! Spoken phrases include "Powerful you have become," "Faith in your new apprentice misplaced may be," "As is you faith in the dark side of the force," "Fought well you have my old padawan," and "Much to learn you still have". It also plays the Star Wars theme music! 4 AA/LRG batteries needed and included.